At least one National Review columnist understands the value of nuance. “I think it is going to prove an enormous non-issue, hinging as it does on what the word “relationship” means to voters. Four paid speeches and some unpaid nice interviews do not make Ben Carson responsible for Mannatech,” National Review columnist Maggie Gallagher writes, regarding Dr. Ben Carson and his dealings with Mannatech. Breitbart News has refuted Geraghty point-by-point, zeroing in on two inaccurate assertions of fact by Geraghty and one highly legalistic interpretation of two sentences uttered by Carson at last week’s CNBC debate. Geraghty has not responded to Breitbart’s evisceration of his inaccurate statement. 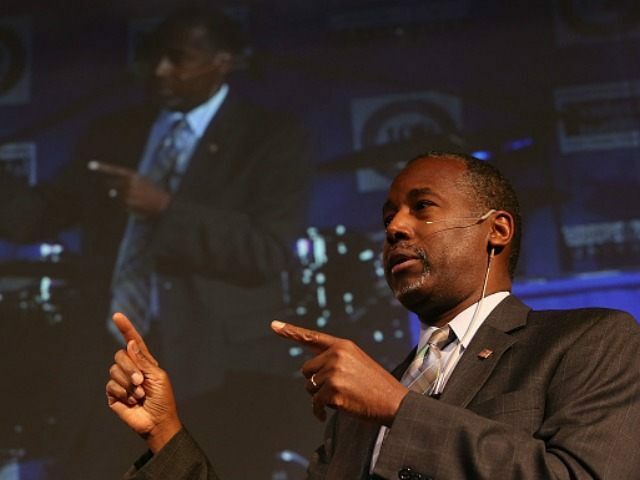 He has, however, denied claims by Dr. Ben Carson to Breitbart News Daily on Tuesday that Geraghty’s “bald-faced lies” smear was politically motivated or undertaken in alliance with a presidential opponent looking to take down Carson. Gallagher is but one voice at National Review. The tone and editorial direction there come from Editor Rich Lowry, who has already come under fire for his blatant hostility to Donald Trump. The charges are having little impact on Carson’s campaign–indeed, he’s rising to the top of the polls. But they’re not helpful to National Review. Conservatives have celebrated the venerable magazine’s 60th anniversary, and would like to see its legacy continue through the next 60 years as well. But that sterling reputation has been built over the past six decades on a rigorous attention to factual accuracy and rock-ribbed conservative philosophy. Letting such a factually incorrect charge as Geraghty’s “bald-faced lies” claim stand flies in the face of that hard earned reputation. Indeed it calls in to question whether the former conservative media stalwart can enjoy its iconic status another 60 days, let alone 60 years. Geraghty’s neatly parsed denial that “[n]o campaign contacted me” when it comes to his “investigation” into the four paid speeches Carson delivered at Mannatech and the two unpaid taped interviews he gave to Mannatech executives in 2004 and 2013 cleverly sidesteps the more obvious explanation for the political hatchet job he and the National Review have been attempting to drop on Dr Carson. Of late,the formerly stalwart conservative publication is ideologically aligned with Inside-the Beltway establishment GOP presidential candidates who are desperately trying to derail the outsider freight trains of the Trump and Carson candidacies. A formal contact between those campaigns and the National Review’s Geraghty is as unnecessary as a signed memorandum of understanding between Jeb Bush’s Right to Rise Super PAC and the Jeb Bush campaign when it comes to shared objectives of two independent but politically on the same page organizations. If National Review were truly not trying to take down Dr. Carson, the editors would clarify their subsequent story that far left outlets used to support their inaccurate claims that “a Carson staffer admitted he had a contractual relation with Mannatech.” The failure to correct that story, along with the failure to retract the “bald-faced lies” claim, puts National Review in league with the numerous far left media outlets – the Daily Beast, MSNBC, TPM, Business Insider – that have weaponized National Reivew’s recent articles as part of their own efforts to take down Dr. Carson. For months, the pattern has been largely consistent. Ben Carson says something outlandish, offensive, or both, which sparks a media controversy. Carson sticks to his ridiculous position, his poll numbers will go up, and the political world moves on to his next outrageous comment. Rinse and repeat. But this week offers something a little different: a Carson lie. . .
National Review, one of the most influential outlets in conservative media, described the Republican’s rhetoric as “bald-faced lies” – which is generally a phrase GOP candidates try to avoid in National Review. There are many words that can be used to describe a media outlet that refuses to retract a politically motivated allegation that has been thoroughly disproven, but “conservative icon” is not among those descriptors. Indeed, the term that publication used to describe the presidential candidate now in its targets seems more appropriate. A statement cannot be a “bald-faced lie” if the person making it believes it to be true and has reason to believe it to be true, whether or not that reason may be persuasive to those hearing the statement. Further, it is also clear that Carson does not consider delivering four paid speeches as “bad behavior,” nor is he hiding it. Nor is he denying that he was interviewed by Mannatech subsequent to at least two of those speeches. National Review editor Lowry, who is also a columnist at Washington-establishment Politico, offered this defense for Geraghty on Tuesday. I admire Ben Carson, but he’s completely wrong about this [the claim Geraghty’s attack was undertaken in cooperation in other campaigns]. Our writer, Jim Geraghty, heard about his connection to Mannatech independently late last year (when, by the way, other campaigns weren’t paying much attention to Carson, let alone dropping oppo on him). Politics may indeed make strange bedfellows, but this alliance of convenience between National Review and the far left media outlets to disparage Dr. Carson is disturbing to even the most cynical Inside-the-Beltway political observers. Breitbart News asked National Review Editor Lowry if the publication planned to correct or retract Geraghty’s claim that Carson made “bald-faced lies” about Mannatech, but has not yet received a response. The longer Jim Geraghty and the editors at National Review wait to retract the false claim that Dr. Carson’s statements constituted “bald-faced lies,” the further in jeopardy that publication’s iconic status becomes.